Listen to "First Commandment" on your iOS and Android device. A master assassin. A vendetta years in the making. And a counterterrorism operative who will risk everything -- even treason -- to keep the people he loves alive. 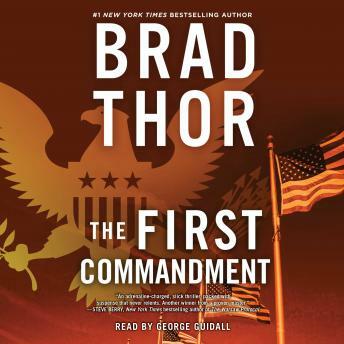 Brad Thor, the New York Times bestselling author of Takedown, delivers an explosive international thriller featuring Navy SEAL turned Homeland Security operative Scot Harvath, who somewhere, somehow, has left the wrong person alive. Six months ago: In the dead of the night, five of the most dangerous detainees in the war on terror are pulled from their isolation cells in Guantanamo Bay, held at gunpoint, and told to strip off their orange jumpsuits. Issued civilian clothes and driven to the base airfield, they are loaded aboard a Boeing 727 and set free. Present day: Covert counterterrorism agent Scot Harvath awakens to discover that his world has changed violently -- and forever. A sadistic assassin with a personal vendetta is wreaking havoc of biblical proportions. Unleashing nightmarish horrors on those closest to Harvath, the attacker thrusts everything Harvath holds dear -- including his life -- into absolute peril. Ordered by the president to stay out of the investigation, Harvath is forced to mount his own operation to uncover the conspiracy and to exact revenge. When he discovers a connection between the attacks and a group of prisoners secretly released from Guantanamo, Harvath must ask himself previously unthinkable questions about the organizations and the nation he has spent his life serving. A renegade from his own government, Harvath will place his life on the line as his search for the truth draws him into a showdown with one of the most dangerous men on the face of the earth. Brad Thor roars through this nonstop adventure full of international intrigue, twisted betrayals, and ultimate revenge. Awesome book. The Harvath character is really great. I like how he is not superhuman and has flaws, makes mistakes, and how previous storylines are all tied in together. Excellent read. Anything by Brad Thor is a must read for me. Good reader. Terrific listen. Great characters, story and narration, but the abridged version left me feeling a little short changed. I wish that I had rented the unabridged version and I recommend that you do so. It is well worth it.